The surprising thing is how modern the Hunter was when it was first licensed out to Paykan. After Billy Roots fucked up his VW Beetle decision it shows a surprising amount of foresight. I totally agree! I think it is beautifully proportioned, straight like an Arrow. It was the PERFECT car for Iran. Almost feels like it was designed for Iran. Here's a photo of me swapping an engine after blowing a hole in the side of the 1725 block back in 1988. 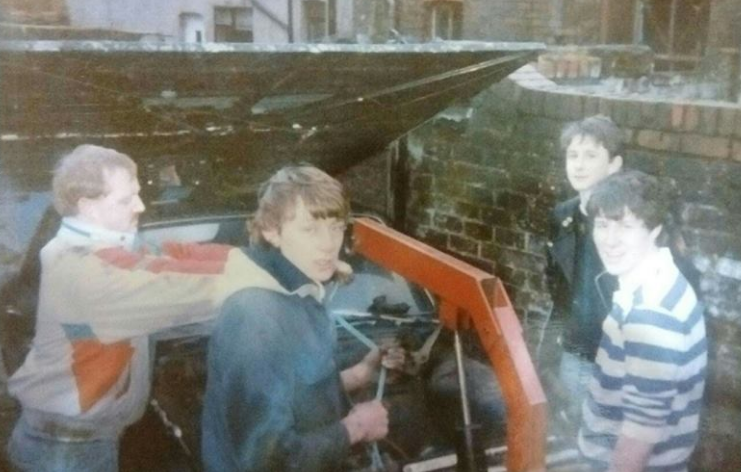 Yeah I'm the one standing next to the engine hoist looking like an Eros Centre rent boy. Can you not put this on YouTube or Pirate Bay? Good to know that zombie in the background didn't get you. RYD776L, tax due March 1987. Not that surprising really! The Paykan in the Coventry Transport Museum is from Peugeot. They got one in the early 1980s to help with development work - perhaps they were doing engineering consultancy on the face-lifted model that came out in the mid 80s. At the time Peugeot Talbot UK were still exporting lots of parts, it was more or less the only profitable activity the company undertook in 81-82. Thanks for the info. The facelifted Paykan was actually done in the UK perhaps one of the last projects under Chrysler/Rootes. It was introduced to Iran in 1979. I went to the Retro Rides show back in the day when it was still at Santa Pod - I'd say 2004 or 2005 - and someone brought a white Paykan. Could have been that one perhaps. It wasn't UK regd at the time, but I remember someone telling me it had come over to be used for some testing on its brake system which had been completed years before then it had been parked up somewhere (can't remember where). Very interesting, I think I know about that car, but don’t know who owns it and where it is now. I'm attempting to get to see this tomorrow BUT the "adventure" website is a triumph (not Triumph) of visuals over information. The Mill Hill School site is VAST (been there before) so the "how to get there" does not include the information "how to get there". No info on trains. underground, parking, No map of the site ! Where do I get tickets for cash on the day as there's none available via interwebs? In 1980 I almost got sent there. I ended up at a school in Hampstead.